“If you want to turn the world into a global village, you will have to remove all the existing villages” goes a Punjabi refrain. The process of removing the existing villages - the lifeline of the developing economies - has already begun. With farmers already disappearing from the US, and with the EU fast keeping pace, it is now the turn of developing countries. No wonder, then, that developing economies face an unprecedented assault from all directions. After all, the world has to be turned into a global village. The social, economic and political upheaval that accompanies the rapid transformation of the villages to integrate globally will determine the future of India - with some 600,000 villages - probably the largest cluster of villages in the world. India lives in its villages. The path to growth and through it bridging these stark inequalities is being charted through economic freedom. For the rich countries’ Organisation for Economic Cooperation and Development (OECD), freedom means “free” markets and “free” trade and investment. Freedom actually provides unrestricted global access to US capital to do what it likes, where it likes and whenever it likes. Freedom means dwarfing democracy, usurping natural resources and trampling the rights of the people in the majority world to ensure that the rich stay rich. The corporate world’s survival hinges on the success of “free” trade and investment. Nowhere has it hit the world more than in agriculture. Strange that from 1995 onwards - the year that the World Trade Organisation (WTO) came into existence - farmers all over the world are a harried lot. They are unsure of what fellow farmers from across their national borders would dump at artificially low prices. These farmers have fallen victim to “free” markets that unleash unfair trade liberalisation, which in the process destroys livelihoods. The free trade paradigm has very cleverly pitted farming communities of one country against those of another. 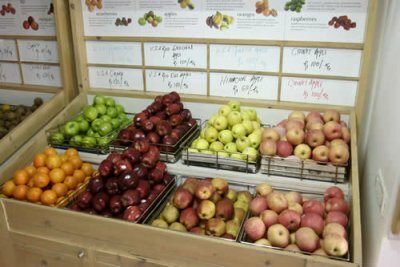 Jamaican farmers worry about cheaper dairy imports from the UK; Filipino farmers worry about cheaper rice imports from the US; Indonesian farmers worry about cheaper rice from US and Vietnam; US apple growers worry about the import of cheaper apples from China; and Indian farmers worry about cheaper edible oils from Indonesia, Malaysia, Brazil and Argentina and cheaper tea from Sri Lanka; the list is endless. Forty years ago, the late Indian prime minister Mrs Indira Gandhi released a postage stamp to mark a record wheat harvest of 17 million tonnes - an increase of five million tonnes from the best ever achieved and an amazing leap from the acute food shortage of 1965-66 - laying the foundation of the “Green Revolution”. It ushered in an era of food self-sufficiency, and by virtue of being food secure, brought true national sovereignty. The Green Revolution saga is now part of history. What made the country emerge out of a perpetual “ship-to-mouth” existence after Independence was a combination of factors: a strong political will to turn the country food self-reliant, an active scientific community, a series of protective policy planning measures and, above all, a valiant farming community. Today, 60 years after India’s independence, a complete somersault in national farm policies is taking the country back to the days of “ship-to-mouth” existence. Sacrificing agriculture at the altar of economic liberalisation, the market is the new agricultural mantra. Hence imports of agricultural commodities have multiplied over the years. In the post-globalisation period, between 1996-97 and 2003-04, imports have increased 270% by volume and 300% in value terms. For an agrarian economy, importing food is like importing unemployment. India imported 5.5 million tonnes of wheat in 2006 and is expected to import another five million tonnes of wheat in 2007-8, in what appears to be an effort to integrate Indian agriculture with the global economy. Through no apparent fault of farmers, and without any shortfall in production, this has turned the country into the world’s biggest wheat importer. The decision to import wheat is preposterous: the government allows private agribusiness companies to purchase domestic wheat at a low price (probably the lowest in the world), and then imports foreign wheat at a much higher price. Free trade and the accompanying policies are thereby forcing the country into dependency. Such large-scale import of wheat is reminiscent of the Great Bengal Famine of 1943, the world’s worst recorded food disaster. An estimated four million people succumbed to hunger and starvation at a time when there was no shortfall in food production. Some 65 years later, driven by global free trade policies, India seems to be following the same path. At a time when there is no shortfall in production, the private sector is stockpiling food. The embarrassing story of wheat is now likely to be replicated in rice. In agriculture, FDI is also coming in the name of technology. The Indo-US Knowledge Initiative in Agricultural Research, Education and Marketing, formally launched by President Bush at Hyderabad on 3 March 2006, is for all practical purposes the soft launch of a second Green Revolution. It is being put in place without first ascertaining the reasons behind the terrible agrarian crisis. Two of the US TNCs which sit on the governing board of the Indo-US Knowledge Initiative, Monsanto and Wal-Mart, have already said that they are not interested in research and development but in selling their products. Tailored to the objective of transferring the unwanted and risky technology of genetic engineering of plants and animals, which is not finding many takers worldwide, the US finds India an easy dumping ground. Seen in the light of contract farming, corporate agriculture, SEZs, FDI in commodities and farm retail and the thrust on agri-business, the entire policy emphasis is clearly geared to allow private control over the food chain. Armed with stronger intellectual property laws and environmentally harmful technologies like genetically modified crops, these TNCs have already launched an international operation to take over global agriculture. The entire food chain has slowly and steadily moved into the hands of three kinds of global conglomerates - Monsanto/Syngenta as technology companies, Cargill/ADM as food traders and Wal-Mart/Tesco as food retailers - under the logic that small-scale agriculture has become a burden on the nation and the sooner the country offloads the farming class the better it will be for economic growth. Trade and investment rules come in handy to strengthen TNC control over the food chain. Agricultural reforms are being introduced in the name of increasing food production and minimising the price risks that face farmers. But these are destroying the production capacity of the farmlands and pushing farmers out of agriculture. The reforms include encouraging contract farming, futures trading in agriculture commodities, land leasing, forming land-sharing companies, and direct procurement of farm commodities by amending the Agricultural Produce and Market Committee (APMC) Act. At present, 16 states have amended the APMC Act, some wholly and others partially, and the government seeks to dismantle the food procurement and public distribution system in the near future. By amending the APMC Act, it is encouraging development of linkages to markets through a variety of instruments, including contract farming and corporate agriculture. Such a system has already played havoc with wheat procurement, forcing the country to become the world’s biggest wheat importer. It will drive the majority of farmers out of agriculture. Farmers need to be left at the mercy of market forces, the mantra goes. Since they are “inefficient” producers, they need to be replaced by the agribusiness industry. The world will therefore soon have two kinds of agricultural systems: the rich countries will produce staple foods for the world’s 6 billion-plus people, and developing countries will grow cash crops like tomato, cut flowers, peas, sunflowers, strawberries and vegetables. The dollars that developing countries earn from exporting these crops will eventually be used to buy food grains from developed nations. In reality, we’re right back to the days of “ship-to-mouth” existence. Even before the WTO came into existence on 1 January 1995, Indian farmers were in the forefront of the global campaign against the unjust trade rules being framed, as the mobilisations against the Dunkel Draft attest. (Arthur Dunkel was the chairman of the Trade Negotiating Committee of GATT.) 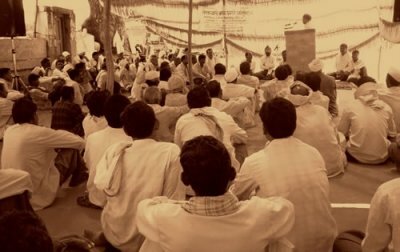 What essentially began as protests against the entry of large TNCs into India’s seed sector, to prevent corporate control over seeds through the Trade-related Intellectual Property Rights (TRIPs) Agreement, later flared up into one of the biggest oppositions to the free trade paradigm. As early as December 1992, the Karnataka Rajya Rayota Sangha, led by the late Professor M.D. Nanjudaswamy, had led farmers to storm the office of Cargill in Karnataka state, throwing away all documents and seeds that they could lay their hands upon. 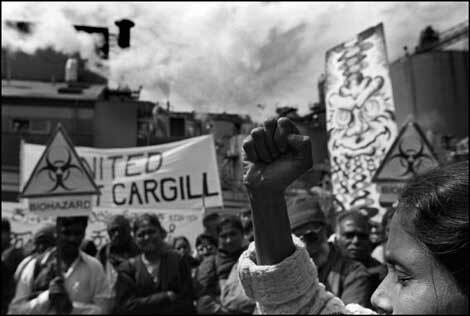 The ransacking of the Cargill Seeds office evoked strong protests from the US Embassy, prompting Prime Minister P V Narasimha Rao to tender an unqualified apology. In March 1993, over 50,000 farmers held a massive demonstration against the Dunkel Draft in New Delhi. Few of the protesting farmers may have understood the intricacies of the Dunkel Draft at that time, but they were sufficiently aware that the proposals would hurt them. The leaders of the “seed satyagrah”, as the agitation was called, warned the government against taking any step that might transfer control of seeds to TNCs. The movement against agriculture in the WTO has continued. Following the farmers’ example, labour unions, NGOs, and various other civil society groups took to the streets. Gradually the political parties understood the complexities and stakes involved in the ongoing negotiations, as a result of which “WTO” soon turned into a household acronym. The movement against the WTO has spread to every corner of the country, bringing into its folds political parties of all hues. Opposition leaders have repeatedly accused the government of insensitivity to public opinion and making commitments without taking Parliament into its confidence. The WTO has emerged as one of the most contentious international trade issues to engage the country’s attention. Gradually the heat at the grassroots began to sweep into the political system. Former Prime Ministers, eminent personalities, literary figures and several mass movements have subsequently put their weight behind the national movement. Primarily because of this heat generated within the country, India’s stand at the WTO has hardened over the years. Knowing that each move at the WTO headquarters in Geneva or the WTO Ministerials is being watched, minutely scrutinised and analysed, India’s negotiators have so far kept national interests in mind while negotiating. But over the years, the fatigue that has crept in among the mass-based organisations is providing the negotiators ample space to make concessions. Opposition to the WTO has also galvanised newer protests against SEZs, land acquisitions and FDI in food retail. Such has been the intensity of these protests that the government has had to bring in a new rehabilitation policy for those displaced through land acquisitions, and has constituted an expert group to oversee the policy of land distribution. 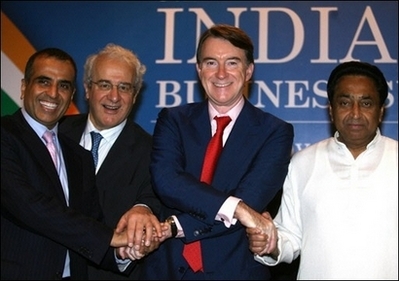 However, the path to economic liberalisation continues. After the suspension of the Doha round negotiations in mid-2006, New Delhi has been under pressure to drop its hard-line opposition. WTO chief Pascal Lamy has time and again visited India, using every opportunity to lobby on behalf of the developed countries. Knowing well that Kamal Nath’s “tough” posturing is aimed only at the gullible media, Lamy has made it abundantly clear that an agreement on Doha has to be reached as quickly as possible. More importantly, and knowing that the country’s entire focus remains glued on the WTO, New Delhi has moved aggressively to sign bilateral and regional free trade agreements (FTAs). Trade liberalisation has already exposed developing country farmers to ruinous competition, driving down prices, undermining rural wages and exacerbating unemployment. Some 20 years ago, with the World Bank/IMF clearly tying up credit under the structural adjustment policies with crop diversification, agricultural policies began to change. In the process, developing countries have been forced to dismantle state support for food procurement, withdraw price supports to farmers, and relax land-ceiling laws, which enables the corporate sector to move into agriculture. The process to shift the production of staple foods and major commercial commodities to the rich and industrialised countries was finally legitimised under the WTO. Crop diversification is the new farming mantra for developing countries. Strengthening the fortress around highly subsidised developed country agriculture, this spells a grim future for developing countries. With cheap agricultural products swamping the developing countries, the world will soon witness the biggest environmental displacement: not from big dams and hydroelectric projects, but in agriculture. Unlike agriculture in the OECD countries, Indian agriculture is diverse and based on available biodiversity wealth. India grows 260 crops every year, whereas Europe and the US cannot count more than 30 crops, of which 10 or so are commercially important. In India, each of the 260 crops is linked to millions of livelihoods. For a country which has nearly a quarter of the world’s farming population - nearly 650 million farmers - sustainable agriculture is the only means to provide viable livelihoods. While the link between farmers’ suicides and the impact of cheap and subsidised imports is now beginning to be ascertained (the government admits that over 150,000 farmers have been driven to commit suicide between 1997 and 2007, and the number is increasing rapidly, with a farmer’s suicide being reported every half hour), evidence points to declining import prices leading to depressed domestic prices and eroding farmer incomes. The continuing WTO deadlock has given India the impetus to reorient trade policies from multilateral to bilateral agreements. India began exploring the possibility of entering into comprehensive economic partnership agreements (EPAs) with 16 East Asian countries, including the 10 Association of South-East Asian Nations (ASEAN) members, China, Japan, Korea, Australia and New Zealand. India had prioritised closer ties to its East Asian neighbours since 1992, the underlying aim being - since developed countries had formed regional trade blocs - that India should build similar partnerships with natural allies in the region. India is also looking for trans-continental FTAs. A bilateral trade agreement with the EU is on the way, and talks have already begun with South Africa and Mercosur (Brazil, Argentina, Uruguay and Paraguay). India is also gearing up to start preferential trade agreements with the Southern African Customs Union (South Africa, Botswana, Namibia, Lesotho and Swaziland). These bilaterals or FTAs aim to eliminate tariff barriers over the next ten years or so, and to remove technical barriers to imports. Explicit guarantees have been provided on treatment to foreign investors and service providers. Current barriers to agricultural biotechnology are being removed. Specific commitments pertaining to national laws and commitments to strong, transparent disciplines on government procurement procedures, rules of origin and effective enforcement of domestic labour and environmental laws are being put in place. In short, all impediments in the march of the TNCs have been cleared. India’s farmers continue to pay the price. For nearly seven years now, Kerala, in south India, is in the severe grip of an unprecedented agrarian crisis. Prices of almost all cash crops, including rubber, have crashed, due primarily to the export-import policy resulting from economic liberalisation and the conditions imposed as part of FTAs: the India-Sri Lanka FTA, the India-Thailand FTA and South Asian FTA. This is happening at a time when more than 80% of Kerala’s agricultural produce is exported. In 2006, import tariffs for edible oil were reduced three times. Since then, the market price of copra, coconut oil and fresh coconut has been falling drastically. In 2007, the import tariff on refined palm oil was reduced from 67.5% to 57.5%, and that of crude palm oil from 60% to 50%. As a result, farmers are getting on average only Rs 3.80 for a fresh coconut. In the wholesale market, the price of copra is Rs 3,200 per quintal (100 kilos), and for coconut oil it is Rs 4,750 per quintal. Coconut oil imports, meanwhile, increased from 7,291 metric tonnes in 2004-5 to 22,307 metric tonnes in 2005-6. Four million coconut farmers in Kerala are being adversely affected by this import surge. Similarly, the removal of export subsidy for pepper and the increase in the number of days (from 120 to 180) for holding the imported pepper for oleoresin extraction has become another threat for pepper farmers. Pepper imports have increased from 2,186.3 tonnes in 1995-6 to 17,725.3 tonnes in 2004-5. No wonder that the two districts of Kerala with the highest suicide rate grow predominantly pepper and coffee. ASEAN nations are also demanding the inclusion of more agricultural products in the zero-tariff list. They have not conceded to India’s offer to bring down tariffs on the above four agricultural commodities by 50% in a phased manner by 2022. But Kerala is not the only Indian state to have been adversely affected. During the period 1990-2005, the import of cotton lint increased at a compound growth rate of over 75%. Cheaper imports are depressing domestic prices, making cotton growers become economically unviable. The majority of farmer suicides are among cotton growers. Meanwhile, India is the biggest producer of milk in the world. Indian dairy farming is characterised by cooperatives involving millions of women and men. Yet dairy imports showed a 292% increase during 2001 and 2003. From near self-sufficiency in 1994-5, India is now also the world’s biggest importer of edible oils, with cheaper imports pushing domestic farmers out of oilseeds cultivation. India is also one of the world’s biggest producers of vegetables. While nearly 40% of the vegetables produced rot because of post-harvest mismanagement, the import of vegetables almost doubled in just one year - from Rs 92.8 million in 2001-2 to Rs 171 million in 2002-3. These imports reached 2.7 million tonnes, valued at Rs 480 million, in 2003-4. Ironically, what is being imported - peas, potato, garlic, cashew, dates, gherkins - are crops in which the country has a surplus and a comparative advantage. While Indian exports are rejected on account of non-tariff barriers, vegetable imports continue to flood the market. With FTAs, on top of WTO and the World Bank/IMF’s structural adjustment programmes, designed to turn developing nations into net food importing countries, it is apparently time for the farmers to quit farming. Dr Ismail Serageldin, former World Bank vice-president and former chairman of the Consultative Group on International Agricultural Research, the bankrollers of the Green Revolution, forewarned some years ago that the number of people estimated to migrate from rural to urban India by 2015 is expected to be equal to twice the combined population of the UK, France and Germany. This means some 400 million people - agricultural refugees - hitting the cities eight years from now. Once revered and respected for feeding the nation, the heroes of India are clearly being abandoned by it. T.N. Prakash, Paper presented at a regional consultation on “Small-scale agriculture in an era of globalisation”, Dhaka, Bangladesh, 17-18 January 2005.